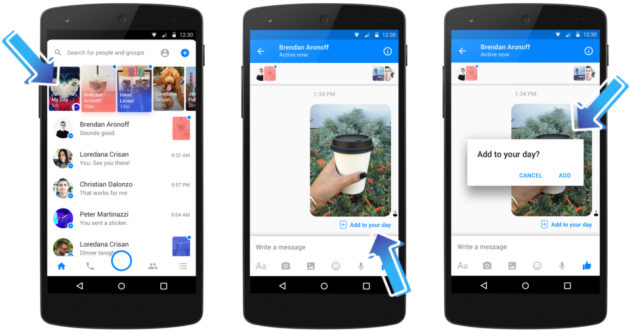 After the introducing the camera option to Messenger and then giving us stickers, Facebook has decided to go all out by introducing “Messenger Day” a new feature that’s pretty similar to Snapchat stories. The new feature allows you to share pictures and videos on Messenger and pick from a choice of over 5000 stickers and filters to personalise it with. In a similar fashion to Instagram and Snapchat stories, your ‘Day’ on Messenger will disappear after 24 hours. With filters such as “Who’s up for?” they’re trying to encourage people to use Days for meeting up with and finding friends. The introduction of Days could also bring in one of the first forms of revenue for Messenger as David Marcus, VP of messaging at Facebook, tells Techcrunch that Day will “probably” use advertisements between posts. This isn’t the first time Snapchat has been used as inspiration - after all, Facebook-owned Instagram has been using a stories feature since last August. While it may seem like a quick copy, Nick Cicero, CEO of Delmondo, claims a 40% decrease in the use of Snapchat stories since Instagram released their version of the feature. According to Justin Rezvani, CEO of TheAmplify, Instagram stories posted by social media influencers are even receiving a 28% higher open rate than Snapchat stories. Facebook has continued to aggressively move into Snapchat’s territory by rolling out Messenger Day first in countries such as Poland and Australia. However Facebook has now released the feature globally for mobile users (you won’t be able to see Days on desktop), so if you want to use the feature you just need to update the app. Messenger already has a much larger userbase than Snapchat with 900 million versus 301 million as of December 2016) and since Days release, Snapchat’s share price has taken a small dip - could Facebook’s new Messenger Day feature see the decline of Snapchat as we know it? It looks like bad news for Snapchat, but what do you think? Will you pick Messenger Day over Snapchat? Send us your Day over on Facebook or tweet us at @moteefe. Go to your messages and click on the ‘I’m feeling’ option. Here you can either take a photo and go through the filter options or you can upload an existing photo or video (your videos can be up to 15 seconds instead of the usual 10). You can overlay your canvas with filters or text by clicking on the smiley face or the ‘Aa’ at the top. Colours can be added with the squiggly line icon and you can change the size with the slider. Once you’re done you can add it to your ‘Day’ by clicking the arrow in the bottom right and then pressing send. You can send to ‘My Day’ or to specific people who are in your contacts list as well being able to customise who can see your ‘Day’. Anything added here will vanish after 24 hours and you can swipe left and right to explore your stories. All of your friends stories will be shown at the top of your messages (next to your stories).